These were the words of Ahmad Fachruddin, Executive Director of BIDARA (Bina Sumberdaya Masyarakat), a non-government organization which has been a long-time Restorasi Ekosistem Riau (RER) partner. BIDARA, which aims to empower local communities in rural Indonesia, has played a key role in assisting the communities around RER concession areas to develop new, sustainable sources of income that do not rely on exploiting the forest. RER and BIDARA have assisted the communities in various ways, particularly farmer groups in the growing of crops on the peatland areas – without any burning involved in the land clearing process. Restorasi Ekosistem Riau (RER) continues to assist the community of Sangar sub-village in Kampar Peninsula in improving their economic situation, with the development of new crops that the farmers in the village are able to grow and sell. Working with BIDARA, RER assists the farmers in the selection of good plant seeds and educates them on the best farming techniques. They are also consultants to the farmers regarding agricultural issues such as pest and crop disease, and even help market the crops grown by the farmers. So far, with RER’s help, the community in Sangar has managed to grow and sell corn, red ginger, melon and – their most successful crop – chili. The resulting income has helped transform the economic prospects of the village. In Sangar, a group of farmers – who call themselves the Maju Bersama Farmers’ Group – initially planted corn on land which they cleared by burning. Some of the farmers worked as day labourers, but continued to grow their corn in the meantime for additional income. Burning was by far the cheapest land clearance method, while the heavy equipment needed to clear land without the use of fire was too expensive for farmers like them. RER and BIDARA assisted the farmers with the provision of hand tractors to clear their land for planting, and then also helped to monitor their crops’ progress. However, the corn did not grow as well as they hoped so the farmers shifted to growing red ginger instead, with BIDARA and RER’s assistance. 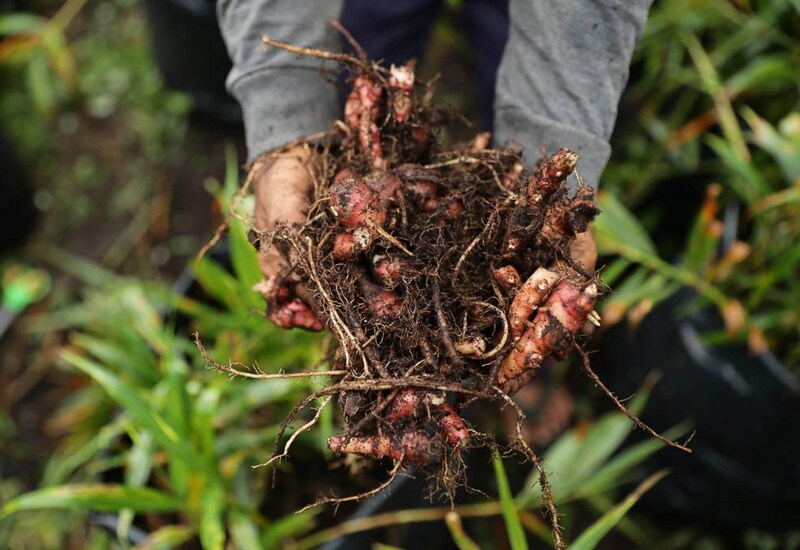 As some of the farmers did not own farmland, they took to their own yards instead to plant red ginger in polybags. Unfortunately, the ginger did not fetch a high price at the market, primarily because the quality of the red ginger grown on peatland proved to be lower than that grown on mineral soil. Due to this, the Maju Bersama group soon decided to switch to red chili. 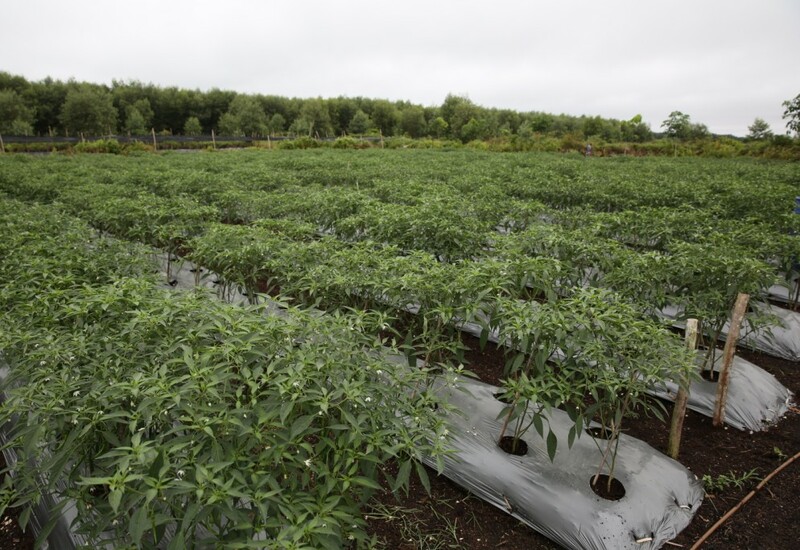 Not only does red chili require a smaller cultivation area for a higher yield, it also requires a much shorter time to grow and harvest, when compared to red ginger. “When other people realized they could plant the area with chili without burning, they started to do the same and plant chili. “Of course, not everyone was successful – but chili became something that the whole community was talking about,” said Ahmad.